This issue of the Dramatic Growth of Open Access highlights and celebrates samples of the many small milestones illustrating the slow and steady increase in open access (dramatic does not necessarily mean fast!). 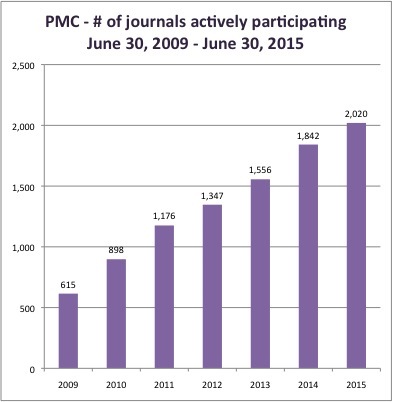 There are now more than 2,000 journals actively participating in PubMedCentral. Over the past year, this number grew by 178 - that's close to one more new entire journal actively contributing content to PMC every business day. PMC now has over 3.5 million items. 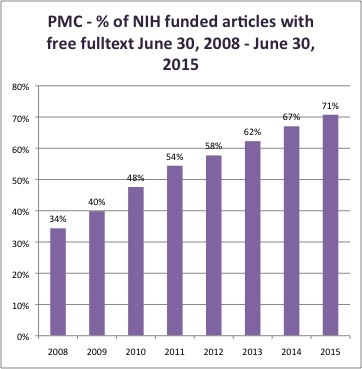 This means that about 15% of all the 24 million items cited in PMC (regardless of date of publication) have free fulltext available linked from PubMed. 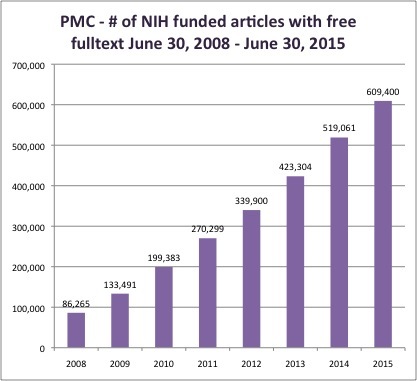 In the last 7 years, the number of NIH funded articles indexed in PubMed (again regardless of date of publication) available for free grew from 86 thousand to over 600 thousand or from 34% to 71%. Other small milestones: there are now over 100 publishers of open access scholarly books listed in the Directory of Open Access Books; the Social Sciences Research Network now includes over half a million full text papers; the Registry of Open Access Repositories now lists over 4,000 repositories; and the Bielefeld Academic Search Engine now has more than 75 million documents. Congratulations and thanks to everyone who is doing all the behind-the-scenes work that results in this dramatic increase in access to our knowledge (whether your initiative is highlighted this particular issue or not). To download the data go to the DGOA dataverse. Directory of Open Access Journals is going through a clean-up project; the number of journals listed decreased by 45 this semester (over the past year growth of 471 titles). Journals and articles searchable by article both grew this quarter. The Directory of Open Access Books lists 3,197 titles from 107 publishers; over 50% annual growth for both numbers. The Electronic Journals Library added 801 journals that can be read free-of-charge for a total approaching 50,000 titles. The Bielefeld Academic Search Engine added more than 3.6 million documents for a total over over 75 million documents. This quarter PubMedCentral added the following (journal rather than article data). A key point is that increases are happening consistently in every category. arXiv added over 25,000 publications and now has more than a million. RePEC added over 64 thousand downloadable items for a total of over 1.6 million. The Logec service has lots of great stats (downloads, content by type and by date); highly recommended for anyone looking for more detail in this area. Social Sciences Research Network added close to 13 thousand fulltextpapers for a total of more than half a million. This post is part of the Dramatic Growth of Open Access series. Note that the dataverse has been cleaned up a little to make it easier to find the current file. ♡2015 by Heather Morrison. Copying is an act of love. Please copy. (from Copyheart). Please copy and share with love. An earlier statement on this general topic follows. As of June 26, 2017, copy and share with love prevails. © Heather Morrison, The Imaginary Journal of Poetic Economics [insert URL to post]. All Rights Reserved. I request that you let me know what you have done (a comment on this post is fine if you don't have my e-mail; if you're doing this just to communicate and don't want your comment made public, just let me know). You don't have to ask my permission first, but I would like to know if people are interested in re-using my work, and if so how (this is topic I am interested in), so I appreciate it if people do ask. Note that you may have rights under fair dealing or fair use that go beyond the permissions I grant here. I encourage you to make full use of your fair dealing / fair use rights. Canada has a good fair dealing regime at the moment thanks to a series of 2012 Supreme Court decisions in favour of fair dealings. I strongly support the fair dealing rights as outlined by the Canadian Association of University Teachers. If your country does not have fair use / fair dealing, advocacy for these rights would be a good idea. Note that when I have used the works of others in this blog, this is almost always making use of my fair dealing rights, e.g. to copy the portions of works of others in order to critique. If you use CC licenses, you should note that when using the works of others you should check for license compatibility, and alert readers to the rights of third parties. Even when one CC licensed works is included in a second work with what appears to be exactly the same license, the Licensor (generally the copyright holder) for the upstream work is different and hence there are actually two different licenses (for example, the attribution and moral rights of the copied work remain with the original Licensor). This is important to understand to minimize your legal risk in copying the work of others. More than 99% of my work has never been licensed for blanket downstream commercial uses, for example. If people use my work in their own works that are CC licensed without the NC element, they risk giving the impression that the copied work is available to others for commercial use. If someone downstream takes advantage of this commercial downstream use that I did not authorize and I decide to take legal action, the downstream user will probably drag the person or organization using an inappropriate CC license into court. This is appropriate because if your site or work is telling others that a work is available for commercial use downstream, then the downstream commercial user is acting in good faith and it is in fact you who are at fault. I think the odds are very remote that I'd ever take anyone to court over a copyright claim; rather, I want to alert well-intentioned people to the risks that they are taking when including third party works in other works with broad liberal licenses. Update June 3: in response to an anonymous question, in case this is relevant for anyone else: if you are preparing a court case and believe that anything in this blog can be useful to support your case, of course you can do so. I appreciate your letting me know, but you don't have to ask permission. This is the kind of use that either is, or ought to be, covered by fair use / fair dealing. You have a right to whatever information can help you in a court case. You should indicate the copyright and where you got the information from. This is more important in terms of presenting your case in the best possible light than protecting my copyright. If you present this work as expert evidence, you need to document where you got the information from, and why you think the author is an expert in this field. It might be helpful to refer to my work web page in this context. Whether your court case is intended to support a commercial argument for you is not relevant. The primary meaning of commercial rights with respect to copyright is selling the work. Ideas are not covered by copyright; for this reason, using the ideas in a copyrighted work does require commercial rights permissions. From 2004 until June 1, 2015, this blog, or to be more accurate, my own work on this blog was licensed under a Creative Commons Attribution-NonCommercial-ShareAlike 2.5 Canada License. If you copied work during this time frame, this license cannot be revoked, however from June 2, 2015 on this blog is no longer licensed under CC. This includes works published previously if you are reading or copying after June 2nd. For those who did copy before this date, I have copied the human readable terms below for your convenience. one instance of friendly re-use of a work by a friend, technically illegal since it was a different license and I'm pretty sure my friend was just making a point about re-use. Nice, but not a good use of the time of my friend who is a brilliant scholar and has better things to do. As a junior scholar, it is helpful to me to be able to prove that others consider my work worthwhile. That's why I would like you to tell me if you re-use my work; this is for my tenure dossier. Creative Commons licensing now includes instructions on what is and isn't a free culture license. Apparently my choices are not free culture. This is technique some call deprecation (intended to push people towards the free culture licenses) that I think is more accurately called bullying or insulting. This is one of the reasons I stopped voluntarily using CC licenses for new works some time ago. Creative Commons has done some awesome work, and I still think it's great to have an option to indicate we want to share rather than automatic copyright. However, I am concerned that this approach actually encourages permissions culture, asking people to think about everything that we do as IP. My current thinking is that it would be better to advocate for strong fair use / fair dealing rights everywhere, push for shorter not longer copyright terms and eliminate automatic copyright. I might be back someday CC if I sense an atmosphere a bit more tolerant of the different choices about licensing people choose to make. CC-BY-NC-SA terms for people who copied portions of my own works on or before June 1, 2105 follow. Note that where I have copied the works of others, the copyright remains theirs, not mine. As a reminder this blog is no longer CC licensed. These terms are copied here for the convenience of anyone who copied works from this blog on or before June 1, 2015.